CR-ACK! Or, if this was a Mighty Thor-comic, KRA-CKA-THOOOM! 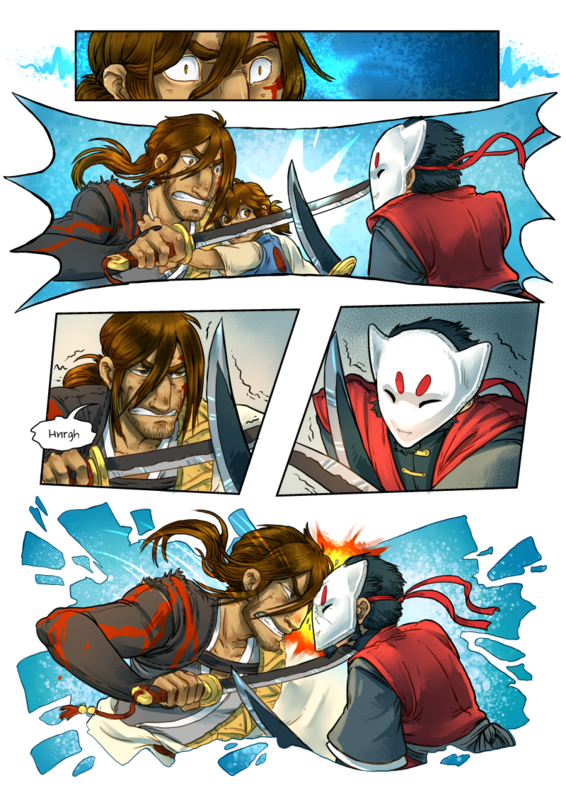 I realize that our grumpy swordsman protagonist has a thick skull, but it’s still not a good idea to headbutt someone wearing a solid mask. The point of a headbutt is generally to break the nose of one’s opponent, since it’s fairly hard bone going against soft cartilage. Against wood or ceramic, not so effective. Yeah, I know – Masahiro has a very thick skull, and it’s a very thin mask. It’s basically a layer of lacquer or varnish over a couple of layers of paper stretched between an outer rim of thin, flexible wood. It’s stiff enough to crack when you smash it, but it’s not solid as such. Ah, laminated paper. That actually makes more sense, thank you. …I’m surprised no one’s tried to stab Akane yet.